Profs. Keren Bergman, Michal Lipson, and Matei Ciocarlie won grants worth up to $500,000 for research and development. 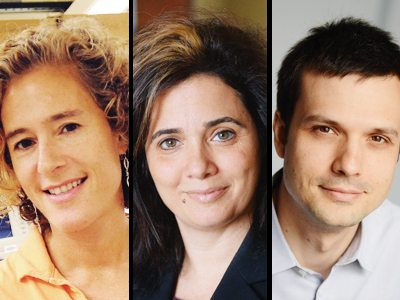 Professors Keren Bergman, Michal Lipson, and Matei Ciocarlie recently won NASA research grants, worth up to $500,000 over two to three years for research and development. Just 15 university-led proposals were selected to receive Early Stage Innovations (ESI) awards for cutting-edge advances addressing key priorities of the nation’s space program. Bergman, an authority on optical interconnection networks and director of the Lightwave Research Laboratory, and Lipson, a pioneer in silicon photonics and head of the Lipson Nanophotonics Group, received an ESI award for their proposal, “Ultra-Low Power Complementary Metal-Oxide Semiconductor-Compatible Integrated Photonic Platform for Terabit-Scale Communications,” which promises more robust and efficient spacecraft contact and telemetry. Bergman is the Charles Batchelor Professor and chair of electrical engineering and Lipson is Higgins Professor of Electrical Engineering. Ciocarlie, assistant professor of mechanical engineering and an expert in reliable robotic performance, received a grant for his proposal, “Versatile Manipulation for Assistive Free-Flyers,” combining his research interests in novel robotic design and control, autonomous and mobile manipulation, and teleoperation. Earlier in 2015, he was named a Young Investigator by the Office of Naval Research. The ESI awards are designed to support NASA exploration goals including robotic missions to Mars and beyond.